Every installation a winner — James Porter. With a growing requirement to carry out heating refurbishments in live environments, James Porter of Remeha looks at how compact, flexible, high-performance condensing boilers provide a winning solution to keeping the heating on. Unreliable heating? Boilers failing? Improved reliability aside, there’s a strong business case for upgrading to condensing boilers which, with their high efficiencies of around 98% gross, deliver rapid financial payback. The Carbon Trust puts the energy savings in the region of 30% — a significant reduction that can boost the bottom line. The cleaner and greener heating provided by this low-NOx technology also contributes to indoor air quality. This is increasingly linked to the improved health and productivity of employees, and ultimately to greater profitability. And then there’s the very fabric of the building. High-performing condensing boilers achieve the controlled environmental conditions that help prevent deterioration and damage, assisting with building maintenance for reduced labour costs. But what about the hassle factor that comes with the installation? Heating is a critical service within a building. Any disruption to the service and the building could face closure, so organisations will be keen to avoid any costly downtime. Added to which, for buildings like care homes, hospitals and hotels, ensuring continuous heating provision is an essential requirement due to the nature of the building. So how to keep the system working while the boiler plant is being replaced? One challenge is to solve the space conundrum. Space is frequently a challenge due to the increasingly reduced size of commercial plant rooms. Fortunately, advances in condensing boiler design help overcome this hurdle to facilitate live refurbishment projects. Today’s condensing boilers are designed and engineered for improved ease of installation, starting with their size and shape. These modern models are lighter and more compact than ever before. As a result, there is the opportunity to spread the heating load across multiple boilers. Designing a system around multiple fully modulating condensing boilers will improve its ability to adapt to fluctuating demand, maximising its energy efficiency. How? By increasing the turndown ratio and modulation capability. The arrangement also allows the boilers to operate at part load, where they achieve their higher efficiencies. And as it reduces use of each individual boiler, it increases their lifecycle for further long-term savings. The small footprint of replacement boilers for the National Library of Wales was key to achieving an easier changeover in this live refurbishment. On live refurbishment projects, a major benefit of the reduced footprint of condensing boilers is that they can fit into the plant room alongside the existing boilers. So the old boilers can be removed gradually to make way for the new ones. It’s a progressive changeover that ensures that the heating service remains on. 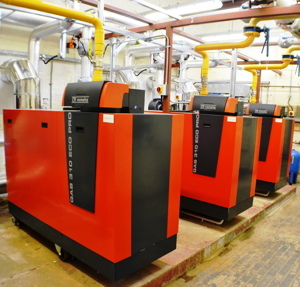 This approach proved successful for Aber Heating Engineers when replacing ageing boilers in two plant rooms at the National Library of Wales. The impressive building is Wales’s primary research library and archive, housing over 6.5 million books alone. Improving the reliability and resilience of the heat-generation plant was a key requirement to protect and conserve the library’s vast collections and archives. Maintaining the heating service was a primary concern — both to achieve the closely-controlled environment that helps preserve the valuable artefacts and to avoid any impact on the thousands of the visitors who come to the site. To meet the output demand, three Remeha Gas 310-500 Eco Pro boilers were specified in the main plant room serving the offices and administrative services. A further three Gas 610-1000 Eco Pro boilers were specified in the book-stack boiler room serving the critical cells where the library’s collections and artefacts are stored. The small footprint of these large-output floor-standing boilers was key to achieving an easier changeover in this live refurbishment. And as the boilers are delivered on wheels, they were also easier to position around the old boilers — speeding up installation, while ensuring that the heating service remained uninterrupted. The result was a smooth and efficient changeover to high-performance heating without disruption to the library’s day-to-day operation. In buildings with a lower heat demand, installing multiple wall-hung condensing boilers on a cascade system offers a simple, high quality solution to live refurbishment. Complete cascade systems typically include a hydraulic low-loss header, all pipework from boilers leading to main hydraulic and gas connections plus all necessary isolating valves — all of which is contained within an insulated unit. And as they are extremely compact and easy to install, they are perfectly suited to live refurbishment. For example, installing six Remeha Quinta Pro 115 boilers with low-loss headers on a cascade system requires just 3.8 m of wall for 642 kW of heat output (at 80/60°C). 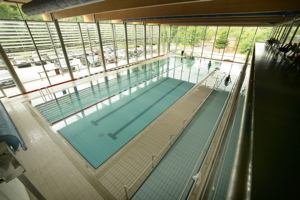 When the boiler plant at the Aspire Leisure Centre needed replacing, maintaining the temperature of the water in the swimming pool at a constant 31°C was critical to ensure the safety of its disabled users. This exceptionally small footprint was central to achieving continuous heat supply at Aspire Leisure Centre, a fully-integrated training centre for both disabled and able-bodied people. When the boiler plant needed replacing, maintaining the temperature of the water in the swimming pool at a constant 31°C was critical to ensure the safety of its users. Seven Quinta Pro 115 boilers were specified to replace the nine existing boilers in the pool-side plant room. Cascade systems can accommodate any number of designs, including wall-mounted and free-standing linear configurations and free-standing back-to-back arrangements. Contractor PHD Mechanical chose to install the new boilers in two banks in a back-to-back configuration. The first step was to separate out and remove the failing boilers. The working boilers were then rearranged into one bank to create space for the first of the new boilers. Once installed, the remaining old boilers could be removed to make way for the second bank of new boilers. The entire move from old to new boilers was completed in one day. Thanks to the space-saving dimensions and flexible design options of the cascade system, there was no disruption to service. And as the temperature of the water in the swimming pool remained constant throughout the job, the centre could be kept open for its users. Condensing boilers are renowned for their high efficiencies and ability to improve the environmental performance of a building. But added to this is the improved ease of installation, the versatility and flexibility of design. It is this combination of high performance and minimum hassle that makes every installation a winner. The building operator benefits from reduced labour costs while avoiding costly or harmful downtime. The building user can be assured of a warm, comfortable environment that leads to greater wellbeing. And the contractor has the tools with which to carry out a quality boiler replacement while meeting the all-important requirement for continuous heat provision. James Porter is sales director at Remeha.